What is Not A Booth? I Want A Not A Booth! What is Not A Booth? Well, imagine a photobooth with no walls, no little curtain hiding the fun from the rest of the party, lots of fun props to play with, and a real, live photographer to make sure your photos are as awesome as you are. Without the limitations of a traditional booth, your photos can have more people, more energy, more originality, and more fun! Not A Booth is run by Brian Diaz and a hand selected few other photographers Brian would trust with his grandmother's recipe for tamales. 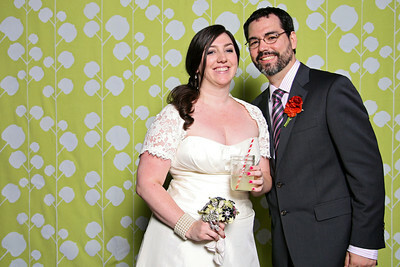 This is a Not A Booth photo of him and his wife (Kate O'Donnell Diaz, the mad genius behind Green Apple Weddings and Events) at their wedding. So if you're interested in the most fun addition to any New York City, Westchester, or Connecticut event in the history of fun, please let us know!